Launch ramp: Keewaydin State Park, near Alexandria Bay. There is an excellent ramp and a fine marina for transients. Plenty of parking for trailers in a designated area up the hill and for tow vehicles near the ramp. Nearby campsites: Nice pull-through sites in the State Park. Swimming pool. 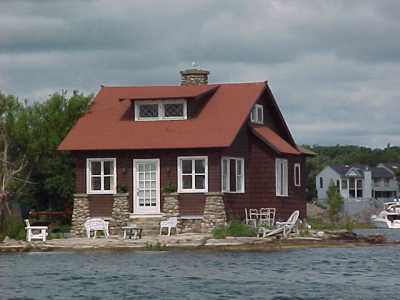 Comments: This is a perfect place to begin cruising the Thousand Islands and the St. Lawrence River. -----We have a family tradition, if 16 years can create a tradition. The fur traders had their annual rendezvous, and so does our family. We gather, each year at a different place, for one week of sharing. 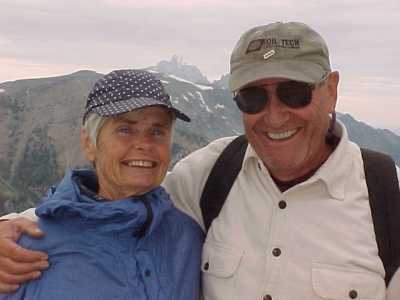 -----This year we flew from New York to the Tetons and met our tribe of 16 - kids and grandkids. Now that the babies are past year one, all decided that we would camp out. The sun god smiled and shone for the week! We climbed, canoed, swam, fished, and chatted to our hearts content. There were marshmallows, songs, and ghost stories around the campfire at night and tired muscles during the day. We took an extra week this year with two of the families, camping in the Wasatch of northern Utah. Hiking into those high Western mountains was quite a change from our life on Halcyon. -----On returning to the Hudson, we said farewells and thanks to Donna and Peter, our C-Dory friends. We drove to the north with Halcyon bouncing along on the trailer behind us. We had no C-Dogs along the St. Lawrence to suggest a ramp, so we "pawed" through our guidebooks. It looked like a possibility in Clayton, NY, so we pulled off the main road and into town. Mistake. This charming river town is full of narrow streets and tourists. We finally ended up down a tiny residential street. I pulled over to give our nerves a respite. A local chap wandered over to look over Halcyon. Serendipity struck. He is a boater and, after a half hour chat about our boat, gave us directions out of town. He suggested launching at a ramp in a nearby state park that is "a boater's paradise." He was spot on. Keewaydin is great. We pulled into the campground, found a grassy site perfect for truck and boat. We unhooked and headed to town to provision for our next journey. -----The ancient Chinese, whenever faced by a daunting counting task, always seemed to end up saying the "ten thousand" things. Our culture is no different - who wants to count all the islands in thhe St. Lawrence river? And then there are the inevitable arguments - is that protruding rock an island? How big is an island? What if it only shows up in low water? How many angels can dance on that pinhead? Humankind seems to be divisible into two groups (how we love to divide into twos!) - the lumpers and the splitters. The lumpers look at a map of the islands, and say "A thousand." The splitters are still arguing and counting day and night. -----There surely are many islands in the St. Lawrence River. They come in an infinite variety. Some are virtually all rock, some all covered by trees, others by mansions surrounded by mowed lawns - a castle even largely covers one! There is something appealing about an island. Most folks seem to love them. There is a magazine devoted to islands. We ponder this appeal as we cruise among them. -----"The world is so vast and confusing. An island can be encompassed in the mind. It represents the known," El muses. "Watch little children play. They build small spaces and then get inside them. They love a big box, or a 'fort' under a sheet-draped table. This is safety - a space all theirs." -----"And we never grow up?" I comment. -----"No, of course not," El says with a smile. "Kids are little big folks, and grown-ups are simply big children." El taught first grade for years and is a master teacher. Every fall, parents would line up outside the principal's office to get their kids in El's class. She respected her students and they knew it - they loved being in school and learning with her. -----Last year she met one of her "kids, " now in college. She's getting her doctorate in literature to write and teach at University. "Remember?" she said to El, with a tear in her eye, "I read better than the others in class. Rather than hold me back with them, you challenged me to write a book. In first grade! And I did it! I have that 'book' on my desk at school to remind and challenge me to strive for the best I can do." El remembered. -----"So islands are comforting," El continued. "In the vast unknowable, they give the illusion they can be known." -----"And there's safety on an island," I followed her theme. 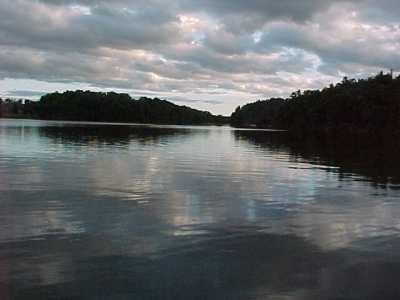 "Surrounded by water, one is protected from wild beasts, human and otherwise. Safe from the maddening crowds, perhaps." 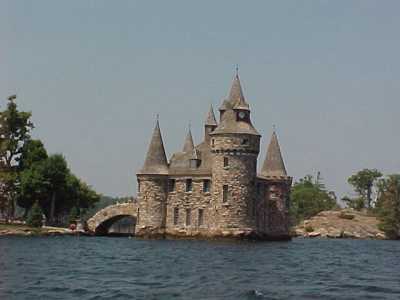 -----We, however, in the Thousand Islands of the St. Lawrence, seemed to be surrounded by maddening crowds of boats all zipping around and crisscrossing each other. It seems that everyone, literally, loves these islands, especially in July! 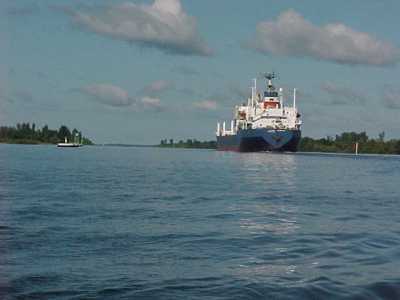 There were huge freighters plying the Seaway, tour boats with guides describing the sights through blaring p.a. systems, fisherman thrashing the shoals with gossamer threads arcing in the sunlight, boats tacking under sail, big power boats - even kayaks and canoes attempting to stay upright in the wakes of all the others.